It's New Years Eve party time! Everyone have a safe and fun filled holiday and a fabulous New Year. Time for another Allan Houser sculpture from the exhibit at the Desert Botanical Garden. This one is called "Watercarrier". At the northern edge of Phoenix stands this beautiful new Sikh Community Center, tucked right at the base of one of our urban mountains. I spotted it from a freeway one day and knew I had to go back to take pictures. Enlarge it for a better view. Here is a view of the midtown area of Phoenix taken from an office window. You can see several buildings that I have feature in the past. The 3300 Building is in the glass building in the center and the Phoenix Fiancial building is that curved building that looks like it has no windows. This view is looking north along Central Avenue. This is a rare sight in the Phoenix area. We don't often see leaves that turn red. They usaually turn yellow and then fall to the ground. I took this and yesterday's photos about a week ago. Since then, we've had a rain storm with a lot of wind. When I pass this tree now, it's almost bare. A week ago I started noticing that a lot of trees were finally diplaying their fall colors in the Phoenix area. Here is one brilliant example. To all my readers who celebrate Christmas, have a very merry and fun filled day! A special note to my sister Judy, Happy Birthday! You had better be good!! Taken in the depths of my Christmas Tree! Holiday shopping, American style; in the ubiquitous shopping mall. A special note to my sister in Missouri, Happy Birthday! 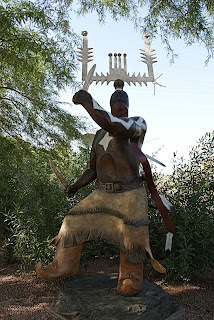 Here is another sculpture form the Allan Houser exhibit at the Desert Botanical Gardens. This one is called "Dialogue". It's a new mosque under construction in north Phoenix. As you can see from the construction materials in the foreground, it's not quite ready to open. There is a new building under construction and I like the lines and patterns. Tomorrow I'll show you the whole building. Sorry for the late post today. I have been having some cable modem issues lately. 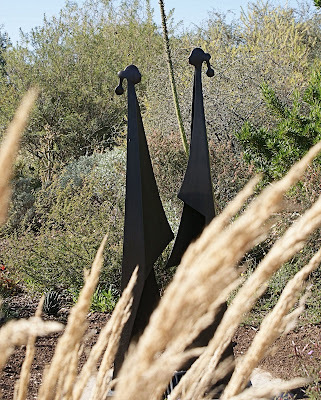 It's time for another Allan Houser sculpture from the new exhibit at the Desert Botanical Garden. This one is called Spirit of the Mountain. I took the top photo the night I was there for the Luminarias event. The small photo shows a daytime view! Every time I see one of these flowers or hear its name, I think of the movie "The Music Man" and Amaryllis, that little piano student who was Winthrop's nemesis. "Amaryllith, Amaryllith." Poor Winthrop, he had such a hard time with that name! Ron Howard has come a long way since that movie was made, hasn't he? This beautiful plant is blooming in the office window of a work colleague. I don't believe I've ever heard of a Christmas Dragon, but here you see one and his reflection in a backyard swimming pool! Yes, I'm still in Phoenix. Last Friday night I joined friends for a tour of holiday lights on a real London bus. It was fun riding on top and seeing all the light displays as we drove by. It seems some chaps have purchased an old London bus and started a business driving it around for parties and other occasions. Check out their web site for more information. 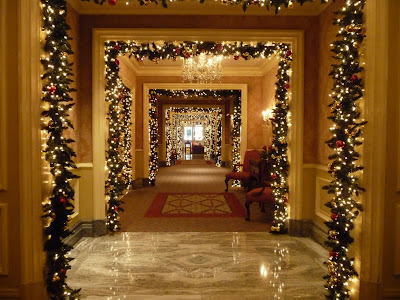 This beautifully decorated hallway was the first thing I saw as I entered the hotel. In fact, those are the doors at the end of this view of the hall. 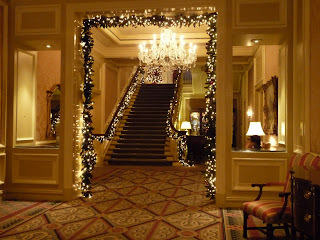 The Ritz Carlton has done a wonderful job of decorating their elegant hotel. The small photo was taken in the wing of the hotel where the meeting rooms are located. It was certainly a beautiful place to hold a December meeting and a holiday party. Last Thursday I attended a meeting followed by a holiday party at the Ritz Carlton Hotel and I was enamored by their beautiful holiday decorations. 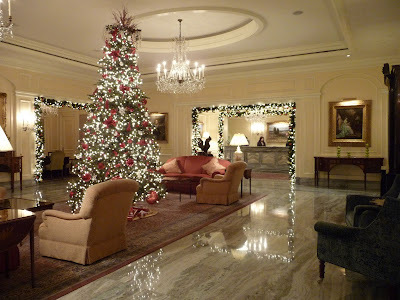 This is the hotel lobby with the big tree in the center and the holiday trim all covered with twinkling lights. As you might have guessed, this is where I spotted yesterday's chandelier. It wasn't difficult to find, there were at least a dozen of them scattered throughout the hotel. Come back tomorrow and I'll show you the view that stopped me in my tracks and made me grab my camera. Special note to my dear friend: Happy Birthday David! 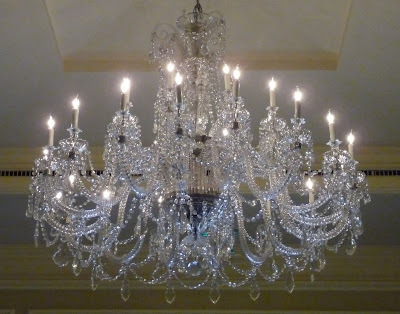 There is nothing quite like a lovely crystal chandelier to make one feel elegant. I'll tell you more about where I found this beauty in the next day or so. I love it when I see one of those wonderful little bees doing their very important work. You go Bee! My readers must think that I spend all of my free time at the Desert Botanical Garden because I feature so many photos from that location. I find the garden to be a peaceful place to walk and think, but the main reason I have such an abundance of photos from there is the many varied events that take place there every year. There is quite literally something there for everyone and during every season. There are concerts, lecture series, art exhibits, and seasonal festivals and parties. Combine all of that with the beautiful surroundings and the rich plant life and you might be able see why I'm drawn to such a place. Today I feature a photo from the Desert Oasis area of the garden. It is a desert water hole that might appear in the the rugged desert of the American southwest. I featured this area last April when the Chihuly exhibit was in full swing. I even added a photo of a frog that was sitting on the edge of the water. Click to link to see it. If I knew someone who had just moved to the Phoenix area and was looking for something interesting to do, I'd recommend a membership to the Desert Botanical Garden. It would be one of the smartest investments they could make in thier new home. Another abstract piece that I liked is called "Migration" and it is located in the heart of the yucca forest at the Desert Botanical Garden. This sculpture is firmly implanted in the abstract phase of Allan Houser's career as a sculptor. The piece is called Cerrillos. I'm not always a fan of abstract, but I do like this one. When I was at the garden last Friday night for the luminarias event, I photographed this sculpture using the floodlights on the piece and my flash. Here is a another sculpture from the Allan Houser exhibit. This one is called "Abstract Crown Dancer". The name of the entire exhibit at the Desert Botanical Garden and at the Heard Museum is "Tradition to Abstraction" and it celebrates Allan Houser's work as it evolved from the more traditional pieces like "Homeward Bound" that I featured two days ago, to a gradual change into distinctly abstract sculpture. This piece combines a little of both worlds. Tomorrow I'll show you a piece that is truly abstract. Every year at the Desert Botanical Gardens there is an event called Las Noches de las Luminarias. The garden is open at night with twinkling lights on many of the trees and all of the paths lined with luminarias. Friday night I attended a members-only event with good friends and in spite of the cold, we managed to walk many of the beautifully illuminated pathways. I should probably put that comment about cold in perspective. It was around 42 degrees (5C), not terribly cold by some standards, but to us desert dwellers, it was bone chilling. There were 10 musical groups performing throughout the gardens. The Dickens Carolers pictured above were one of the lucky ones in warm constumes. Some of the others were working hard to stay warm. There was even an ice skating rink available. No, it wasn't cold enough for ice. They used some type of sythetic material. I think it worked pretty well judging from all of the skaters using it. My favorite part is follwing the golden glow of the luminarias along all those familiar pathways. Another sculpture from the Allan Houser exhibit at the Desert Botanical Gardens. This one is called "Homeward Bound" and depicts a young woman walking toward her home with her sheep and her little dog following behind. I love this one and I like the way they bridged it over a shallow arroyo. I still have more sculptures to show and I'll fit them in throughout the next few weeks. Lovely pomegranates right on the tree! While at the Desert Botanical Gardens on Sunday afternoon, a storm rolled in and the wind started to kick up. As I was leaving the garden, I spotted the flags flapping noisily in the wind through the opening in the shade canopy at the entrance. I thought it would make an interesting photograph. Sunday was the last day for the Monarch Butterfly exhibit at the Desert Botanical Gardens and what a treat it turned out to be. 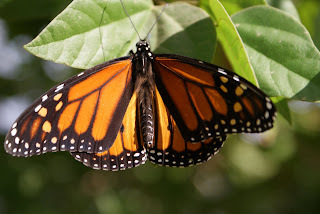 The temperature stayed below 70 degrees making the butterflies seek the warmth of the sun. They all clustered on one tree decorating it like delicate, festive holiday ornaments. It was quite a sight to see. Click on the photo to enlarge it and get a better view. I even got some great close up shots like this one, just because they were so still and quiet. They seemed to be posing for a portrait. Last winter, these two hummingbirds buzzed around me and hovered in front of my face as if to say "it's time to fill the feeder." 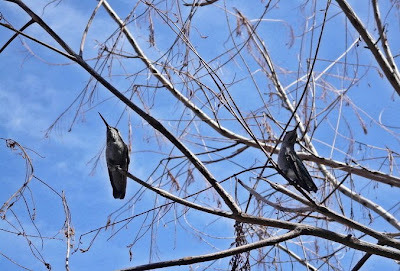 As soon as I took the feeder inside, they perched themselves in a nearby tree and waited patiently for their nourishment. Click here to see how others have used today's theme.